Top Notch Home Inspection is your Portland Oregon Sewer Scope Company. Typically your home’s sewer line goes from your house to the street where it ties into the public sewer system. In many areas the homeowner is responsible for their line to the middle of the street. So depending on the location of the issue, you may or may not be responsible for a repair. A sewer line can be made up of many different types of pipe including cast iron, plastic (ABS, PVC), and Orangeburg (like tarpaper rolled up and laminated with asphalt). 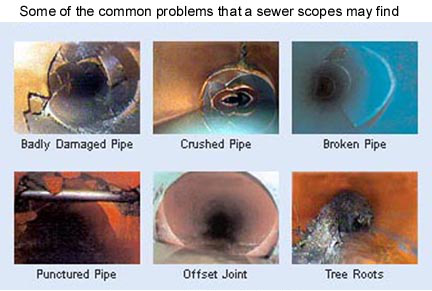 Each type of pipe has its own set of issues. An Orangeburg pipe, although very strong can be crushed. A cast iron pipe can show deterioration over the years. A plastic pipe can have a pitch problem with the flow backing up. All of these pipes have potential for root penetration which causes blockage and backups. A new sewer line may not even be hooked up. What if you find nothing wrong? Then yahoo! But what if you DO find something wrong? Sewer line repairs are costly. These lines can be deep in the ground and can be very long. Cost can run into the thousands of dollars. Whether the repair is to “burst” the pipe with new line or cut out and replace sections, it can add up quickly. As for roots, well they might seem like a minor issue. But consider this – roots don’t just go away, they get worse.